When I think of gyudon, I think easy, convenient, and cheap. In Japan you can find countless fast food chains serving up a hefty bowl of beef simmered in a delicately sweet yet savoury sauce over a bowl of steamed rice with a side of miso soup and pickles all for under $6! Gyudon (gyu = beef, don short for “donburi” = rice bowl) is one of my favourite dishes to make when I’m sort on time or need something of substance that will feed a growing boy (Kevin ) and keep him full for long. 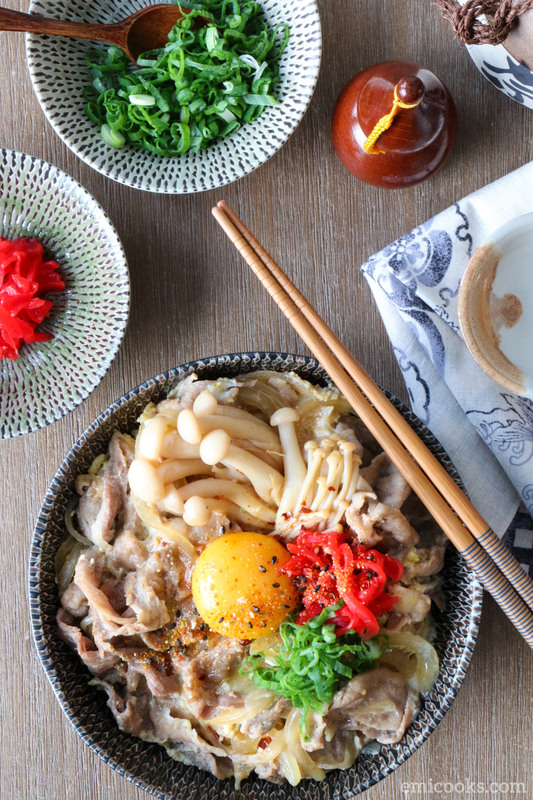 Growing up my mom made gyudon and oyakodon (chicken and egg rice bowl) quite frequently, it was quick, it was easy, and it was delicious. Both were prepared in a similar manner – onions and meat (beef or chicken) cooked in a sweetened dashi-soy broth served over rice. 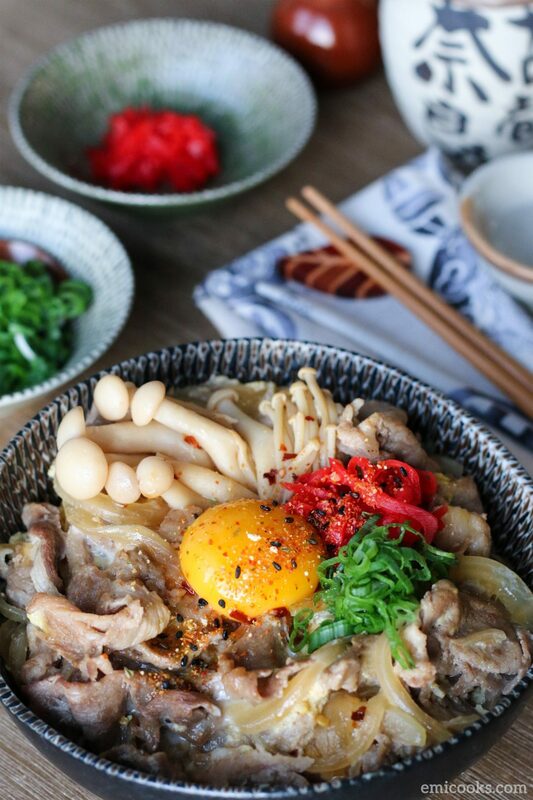 Sometimes my mom would throw an egg into the mix, just as she would when preparing oyakodon, or other days she would keep it traditional (just beef and onions). I guess it really depended on how many rascals she had hanging off her while cooking dinner! To make this a balanced meal, my mom would always add extra vegetables either cooked in the broth or stir fried on the side. I personally like adding different kinds of mushrooms like shiitake, enoki, and shimeji (as shown below). Today, I’ve made this dish way more than I’ve probably made anything else (that is a lie – oyakodon is probably on the same level as this). Sometimes I don’t have all the ingredients in my pantry and I have to omit some ingredients (e.g. sake, mirin, ginger, etc. ); however, it’s safe to say that this dish will still turn out amazing no matter what! Dashi – Broth that forms the base of most Japanese dishes. This can be prepared at home with a combination of ingredients such as kombu (kelp) and katsuobushi (bonito flakes) or made with instant dashi powder. Soy sauce – One of the main seasonings that lend a savory taste to simmered dishes. Soy sauce is made from soybeans, wheat, and salt – so those who suffer from gluten sensitivity should use a gluten free version. Sake – Cooking sake brings a whole new depth of flavour to dishes, just like wine does. You don’t have to buy anything fancy, it just has to be drinkable. You can find cooking sake in Asian grocery stores next to Mirin. Mirin – Sweetened rice wine used to round out flavours and soften fishy overtones. Adds thickness and a mild sweetness to sauces and simmering liquids. Can be substituted with sugar (not equal proportions, about half to a quarter or less depending on your sweetness preference). Rayu – Japanese chili oil made with toasted sesame oil, red chili flakes, garlic, green onions, and other flavourings. Can be substituted with toasted sesame oil or a simple homemade chili sesame oil. Ginger – I think we all know what ginger is. 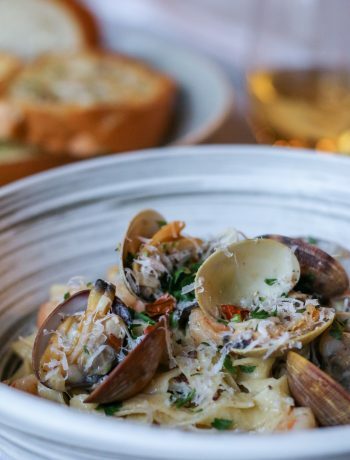 Its adds a refreshing flavour to this dish. 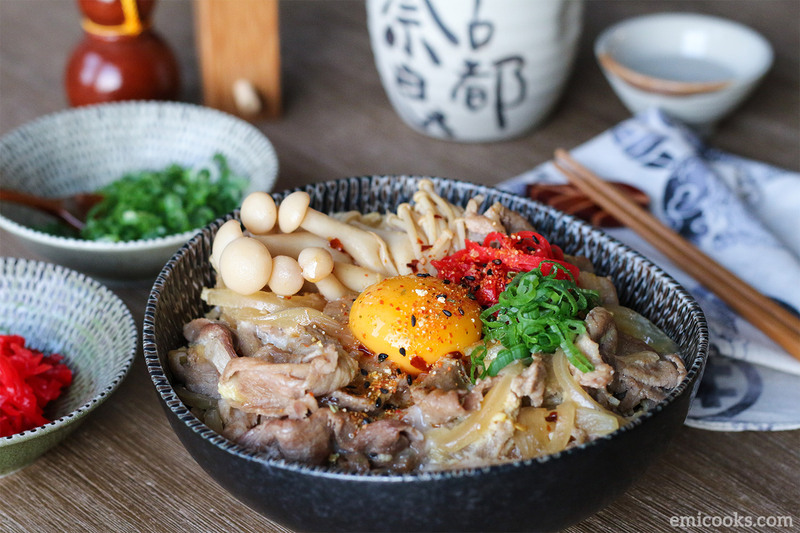 Note: The first four listed ingredients really form the basis of any Japanese dish, so I suggest if you are keen on Japanese cooking you stock up on these Japanese pantry staples. Since my recipe for gyudon includes an egg mixture, I like to cook each portion individually to retain the nice round shape of the cooked eggs. It’s all about presentation! Luckily I have two small frying pan so I cook them at the same time. If you only have one frying pan and don’t want to wait to cook the other portion, use a larger pan to cook all the ingredients in the pan. 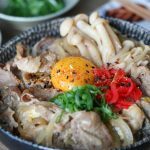 My recipe below details the steps to cook gyudon an individual portion at a time, therefore you can ignore the “halving” of ingredients if you are cooking the two portions together. Now that you have the liquid flavouring, all you have to do is add in the onions and beef, cover and let it simmer for a few minutes. You want to cover the pan so majority of the liquid is retained. If you notice the liquid reducing too much just add in more water, a tablespoon at a time. We want this dish to be a bit saucy so that the rice beneath the onion-beef-egg mixture is flavoured, but not soupy in that the dish has turned into a rice porridge. If you want, you can definitely add in some other ingredients like carrots, mushrooms, or even tofu (I prefer silken, not firm). When you cook beef (or any meat) in liquids you’ll probably notice some foam or froth appearing in the liquid. As the meat cooks, the proteins breakdown, and are released into the liquid. You don’t have to skim the excess foam off, but I suggest doing so anyways to have a more aesthetically pleasing and clearer liquid. Once everything is cooked, the liquid is skimmed, add the lightly beaten eggs (a few whisks with a fork or chopsticks to break the yolk and just slightly incorporate the yolks into the whites). Cover and turn the heat to low. Setting the eggs will only take a few minutes or less. I prefer a loosely set egg, so I only cover the pan for a minute. If you want the eggs fully set cover it for 2 to 3 minutes. Just as a side note, two beaten eggs to one serving of gyudon is the perfect ratio. Just one egg isn’t enough to cover the entire frying pan. As you can see in the picture below, two eggs nicely flows throughout the pan. If you only want to add one egg, you may as well skip adding the egg to the frying pan, and instead top the beef and onion mixture with a fresh egg yolk as garnish. Mmmm, yum! Plating is pretty easy. Just run your chopsticks or spatula around the perimeter of the onion-beef-egg mixture, tilt the pan over the bowl of steaming rice, and the mixture should slowly slide onto the rice. See how easy that was? This is why it is preferred to cook the portions individually. Now you’re almost done. You can eat the gyudon as is, or if you happen to have some green onions, shichimi togarashi, and beni shoga add these on top as well. If you are feeling extra indulgent as I was, you can add an egg yolk too. A Japanese favourite, both in the home and on-the-go. This beef and rice bowl is a common convenience food that marries the sweetness of onions with the savoury seasonings and fatty ribeye beef all in one bowl. Best of all this dish is easy to make and can satisfy the hungriest of cravings. To make the dashi flavouring: In a 2 cup measuring cup, combine dashi broth, sake, mirin, soy sauce, chili sesame oil, and ginger. Mix to combine. Reduce to medium-low, uncover the pan and add half of the ribeye. Spread the ribeye slices around the pan to evenly cook. Cook covered, while stirring occasionally, for an additional 5 to 8 minutes. If needed add a tablespoon of water to ensure the level of liquid is maintained. Using a skimmer, remove the “froth” that develops at the top of the liquid and discard. Reduce to low, uncover and add half of the beaten eggs. Spread the egg throughout the pan, cover and cook for 1 to 2 minutes until the eggs are almost set but still runny. Using chopsticks or a rubber spatula, run the utensil around the frying pan to loosen the egg. Pour the beef and egg mixture over the steamed rice. Garnish with 1 raw egg yolk, drizzle of chili sesame oil, green onions, beni shoga, and shichimi. Repeat steps 2 to 7 for the other portion. This recipe can be made with or without the beaten egg mixture. I like adding egg for extra substance and garnishing with egg yolk for extra creaminess. Since I add beaten eggs to the mixture, I cook each portion of the gyudon in separate (small) frying pans to retain the circular shape once the egg has set. This allows for nice presentation when transferring the cooked beef mixture to the bowl of rice. Ribeye cut is preferred, but flank, chuck, or hot pot sliced beef will work as well. I’ve provided suggestions of Optional Add-Ins if you are looking for additional vegetables and ingredients to add in. Feel free to add other ingredients to your liking. If you don't have mirin, you can substitute with a ¼ to ½ teaspoon of white sugar. Depending on your preferred taste, I suggest adding sugar in small amounts and tasting as you go. 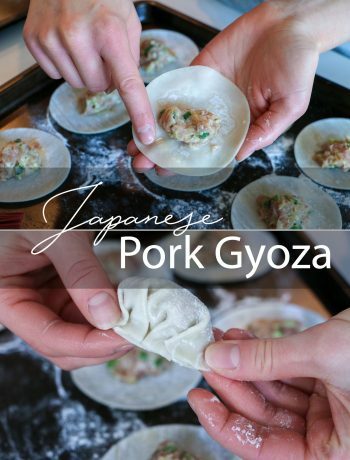 To make this recipe Gluten Free, substitute regular soy sauce with gluten free soy sauce.